Mexico City, Mexico – The Vertex Companies, Inc. (VERTEX) is leading the development of a 30-megawatt solar electric power plant located in Zacatecas, Mexico. When complete, this project will be one of the largest of its kind in Latin America. 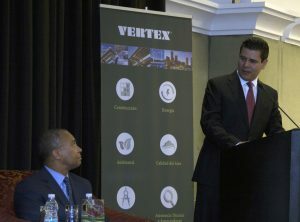 The announcement came during a reception held on March 20th as part of the Massachusetts – Mexico Innovation Partnership Mission. Leading this reception was Massachusetts Governor, Deval Patrick and Zacatecas Governor, Miguel Alonso Reyes.